I normally do this on my toes, but that would've been a lot more work for this how to, and I have ugly workers nails from working out in a shop all day, so I probably should've shaped my nails a little better before starting this, but you get the idea! 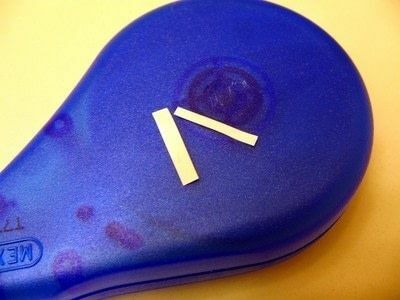 Paint a light coat of clear - this is very important for the correction tape to stick. 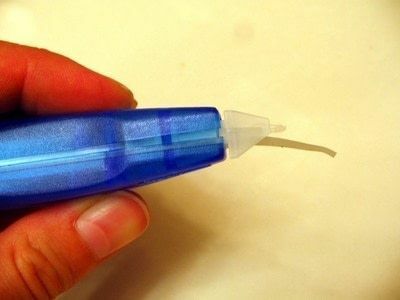 You will need to cut the loop free on the correction tape, so unless you're able to reconnect yours (I've tried many times and can't do it!) it's sorta designated to this project. 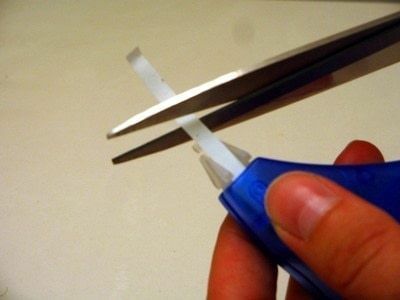 Cut a length of tape longer than your nail is wide. Cut the strip in half, or to a width your want your tip to be. You can leave it straight or give it a little curve on one side. Since I normally do this on my toes, the only crucial one to curve is the big toe which is easier because it's bigger and the rest can stay flat since they're so small... but do it how ya want. This is where it gets kinda hard to do and explain. 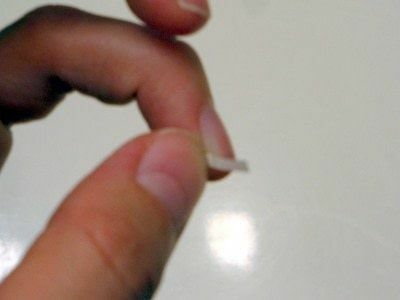 Place the edge over the crease in your nail and press it in with your thumb nail, take the strip across your nail and while still holding the first side, press it in the crease on the other side with your other thumb and rub the correction tape on your nail like a rub on transfer. This might be easier with a friend, but it's doable by yourself once ya get the hang of it. 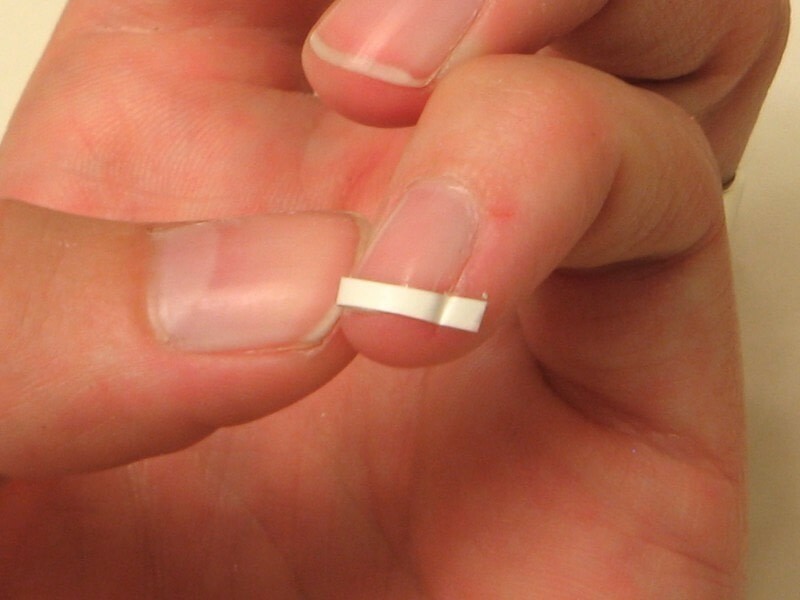 By cutting the strip longer it makes it easier to put on because you want it to stick to your skin on either side of your nail if it's not easy for you to rub the tape and hold everything in place. 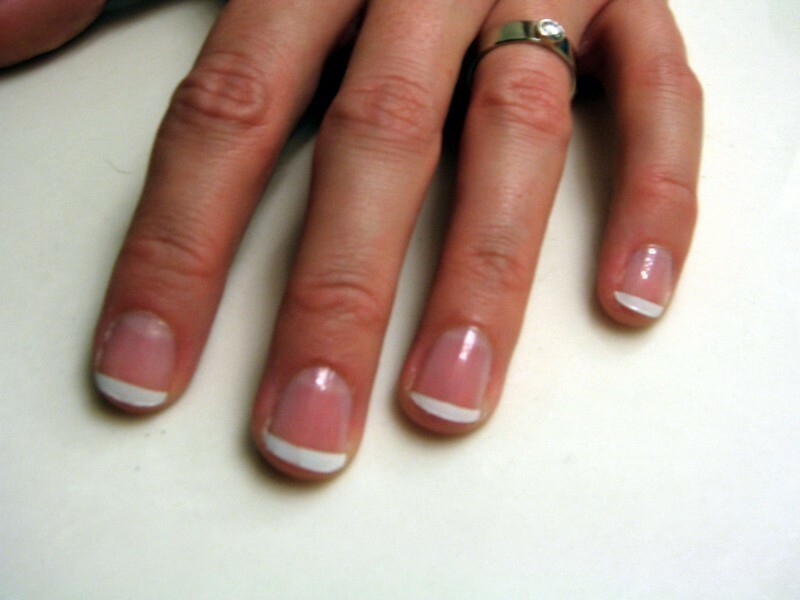 Clean the edges off with your other nail in a downward pinching sort of way (don't scrape, it'll tear the edge and look bad) and give it 4-5 thin clear coats on top. This is really cool. I love it when you can utilize something in more ways than it was originally intended!! Great job. This is a really great idea! I'm going to try it soon. Thanks so much for posting! Wow! I never thought of that! !